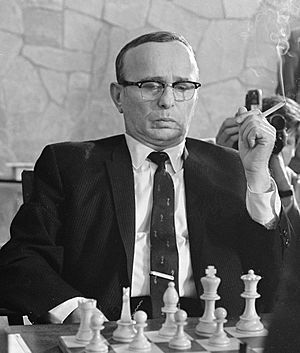 Samuel Reshevsky (Szmul Rzeszewski, near Łódź, 26 November 1911 – New York, 4 April 1992) was a Polish-American chess Grandmaster. Sammy was a famous chess prodigy, and later a leading American chess Grandmaster. He was a contender for the World Chess Championship from about 1935 to the mid-1960s. He came equal third in the World Chess Championship 1948 tournament, and equal second in the 1953 Candidates Tournament. He was also an eight-time winner of the U.S. Chess Championship. Sammy was tremendously strong in matches, and the Soviets made sure he never got the chance to play Botvinnik in a match. He played eleven of the first twelve world champions, and drew a match against Fischer at the age of 49. His one weakness as a player was his time trouble. He used up so much of his time in the early stages of a game that he was often short of time at the end. This probably cost him the Candidates tournament in 1953. 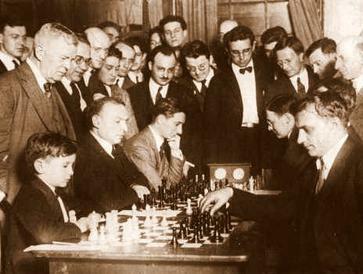 Reshevsky was not a full-time chess player. He was a qualified accountant. Reshevsky, Samuel [and Fred Reinfeld] 1948. Reshevsky on chess. [aka Reshevsky's best games of chess, Dover.] Chess Review, N.Y.
Reshevsky, Samuel [and Fred Reinfeld] 1962. How chess games are won. Pitman, N.Y & London. Gordon, Stephen W. Samuel Reshevsky: a compendium of 1768 games. McFarland, Jefferson NC. Some annotated by Soviet grandmasters. Samuel Reshevsky Facts for Kids. Kiddle Encyclopedia.